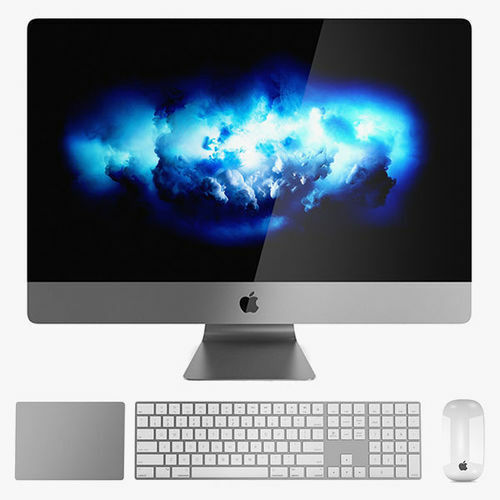 Apple iMac Set 1: + Apple iMac Pro 2017 + Keyboard + TrackPad 2 + Magic Mouse 2 ----------------------------- Bee3dd is a team who making 3d model best quality, you don't need worry when use our models. We take care to build the smallest detail in the model to ensure the best results. These things are not in others. Our slogan is: best quality - best price! Don't forget visit official site of bee3dd team! ----------------------------- The model has a fully textured, detailed design that allows for close-up renders, and was originally modeled in 3ds Max 2012 and rendered with V-Ray. Fidelity is optimal up to a 2K render. Renders have no postprocessing. ----------------------------- File Formats: + 3ds Max 2012 + Vray 2.0 full setup lighting, camera + 3ds Max 2012 standard + Cinema 4D R12 standard ( materials and textures was setup ) + Maya 2012 standard ( materials and textures was setup ) + Lightwave 11 ( materials and textures was setup ) + FBX 2012 + OBJ 2012 + 3DS 2012 + 1 file 360 product ( 60 images 1200*1200 pixels ) All models before 8-2017 haven't 360 product but if you need it please contact us to get yours in 24 hours. ----------------------------- Geometry: + No isolated vertices + No coincident vertices + No coincident/coplanar faces + Quads and Triangles only ( Clean edge flow, mostly quads, subdividable topology, no poles with more than 5 edges on the model, holding/support edges present to retain shape after subdivision ) + Models resolutions are optimized for polygon efficiency. (In 3ds Max, the Meshsmooth/Turbosmooth function can be used to increase mesh resolution if necessary.) + Real-world scale ( We make 3d model from actual size and images reference. It is best for making video intro, marketing, animation, games... ) + Naming and Organization ( All geometry is contained in a single layer structure, with the layer having the same name as the product. ) ----------------------------- TEXTURES: - Textures highquality, enough for close-up render ( 2048-4096 pixels ) - UVWs mapping with mixed: overlapping and non-overlapping - No texture paths referenced by the model. All texture paths were stripped from the model. ----------------------------- About Bee3DD: ( Working in 3d modeling since 2013 until now ) + We offer all electronics 3d model ( latest and oldest ). Our collection is biggest in the world. It is place where you can find anything about technology for your project ( earlier and faster than others ) + Every model we build goes through thorough Quality assessment both visual and technical to make sure the assets look realistic and the models are of the best quality. Good modeling, interesting price/quality ratio.